Elevated between 5741 ft and 10531 ft, the Ski Resort is among the 5 highest elevated Ski Resorts in Austria. The vertical drop from summit to base is 4790 ft. The average difference in altitude between base and summit of Ski Resorts in Austria is 2392 ft. Most runs are therefore relatively long. Season starts on Oct 6 and ends on Jun 2 (239 days). Average season duration in Austria is 114 days. Average snow depth during the season (Oct 6 to Jun 2) is 87 " at summit elevation and 13 " at base elevation. Snow coverage is usually best during March, offering an average snow depth of 128 " at summit elevation and 23 " at the base. 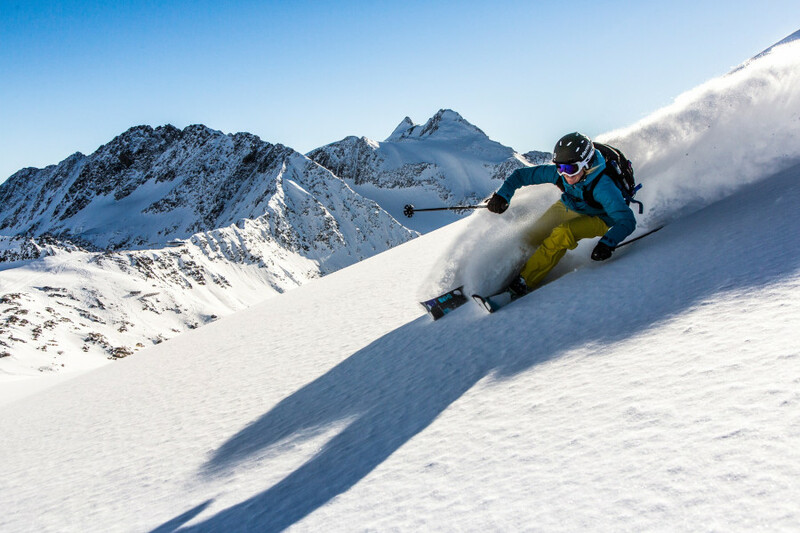 Therefore Stubai Glacier is among the 10 ski Resorts with best snow conditions in Austria. 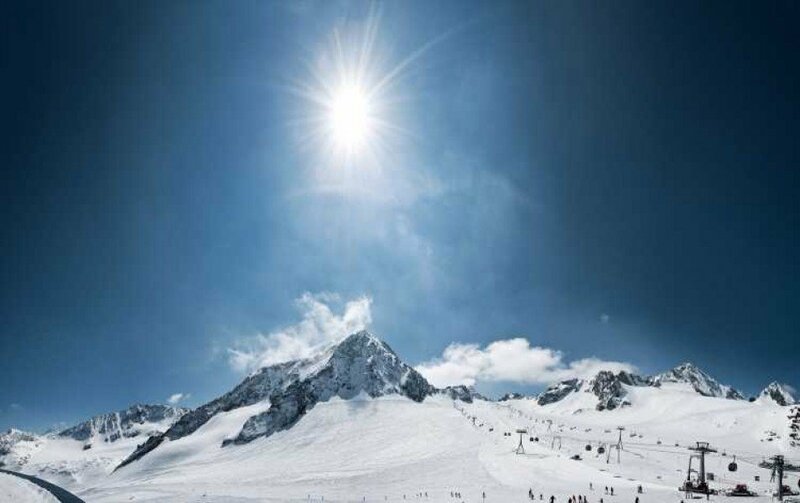 Stubai Glacier features 114 sunny days on average per season. 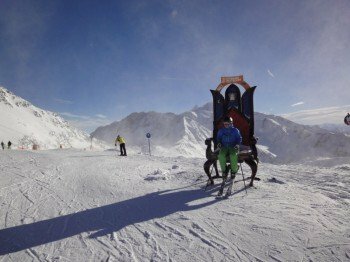 The average for all ski Resorts in Austria is 115 sunny days. April is the sunniest month with an average of 21 sunny days. Do you like laid-back carving? Or taking it slow with the kids? Do you like shredding ‘til the sun goes down? Or getting some serious air time? Whatever you enjoy, Stubaier Gletscher has something for just about everyone. The ski area offers up 62 kilometres of immaculate trails to explore. The longest run is some 10 km in length, winding down from the Wildspitz mountain station at 3,210 m to the Mutterberg base lodge down at 1,750 m in the valley. Around one third of the runs here are suitable for beginners (blue-marked), a fact that makes Stubaier Gletscher a great choice for families. On top of that, the BIG Family Camp is a great spot for keeping little ones occupied while parents enjoy the slopes. This specially designated area is located close to the Gamsgarten mountain station and encompasses the “Miniland” zone as well as magic carpet lifts, nursery slopes, obstacle courses and wave slopes. And as if that wasn’t enough, the area also has its own kids’ restaurant and an inviting lodge for thawing cold feet! For kids aged 3 and over, there is also an indoor kindergarten to keep youngsters occupied while you hit the slopes. Kids will find plenty of interesting terrain to explore away from the camp in the rest of the ski area, with a fun slope as well as a permanent race run, where you can do battle with members of your family. The so-called “comfort piste” is also ideal for families. 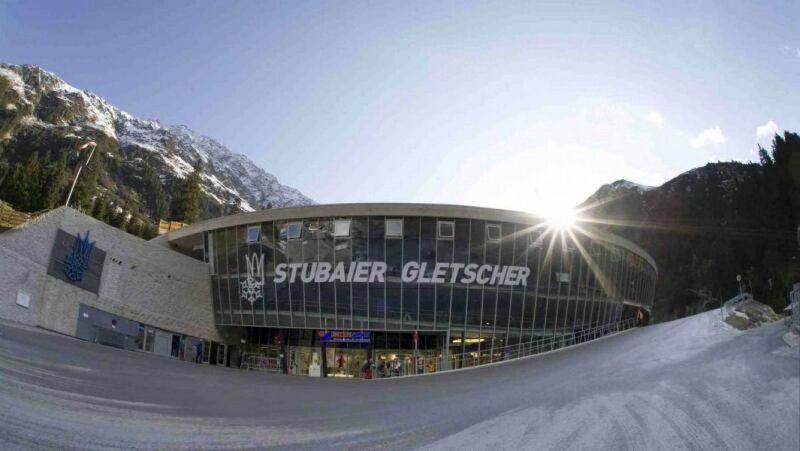 More advanced skiers and snowboarders will find a very different side to Stubaier Gletscher with lots of thrills and adrenaline-pumping highlights. If you are looking for a challenge, look no further than the Daunhill run – the steepest slope in the ski area and not for the faint-hearted due to its gradient of 60%. In addition, there are nine ski routes as well as 15 freeride runs to keep powder hounds happy. There are several freeride checkpoints dotted across the mountain which keep freeride skiers up to date with the current conditions. 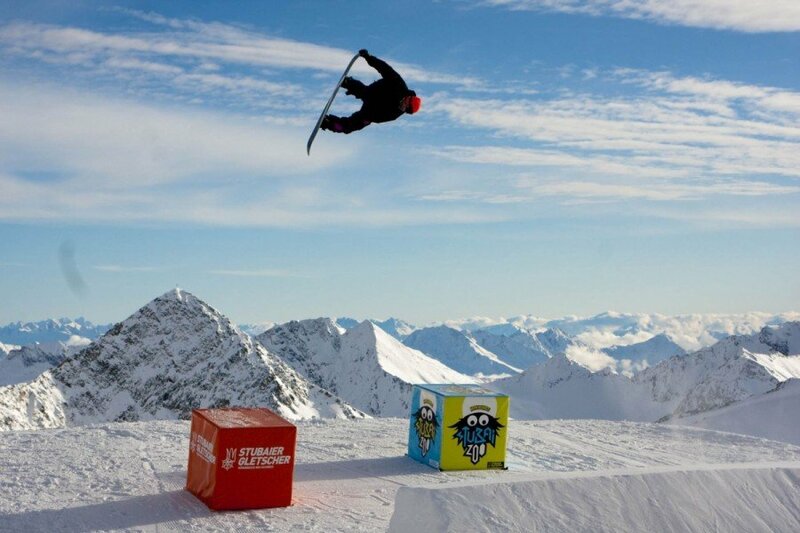 Among snowboarders and freestyle skiers Stubaier Gletscher is known above all for one thing – Moreboards Stubai Zoo. 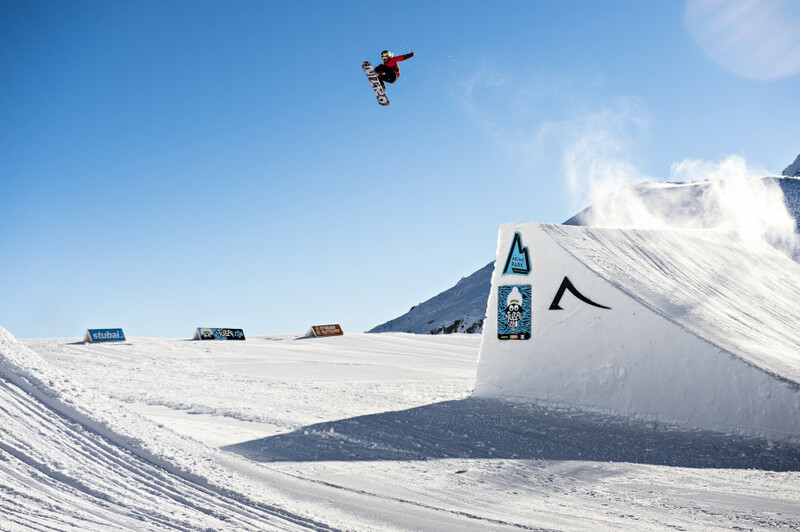 It’s easily one of the top terrain parks in Europe and a true hub for the great and good of the international freestyle scene. With easy, medium and pro lines, there are a wide range of unique features waiting for skiers and boarders of all levels. Jumps, butterboxes, wall rides – you name it, they’ve got it. And if you just want to enjoy some great carving on-piste, Stubaier Gletscher offers up a wide selection of varied runs. There are 34 great trails to explore across the mountain. With easy runs like the Daunferner, intermediate trails like the Silberschneid and tough challenges like the Schartenschuss run – there is something for every taste and skill level here. 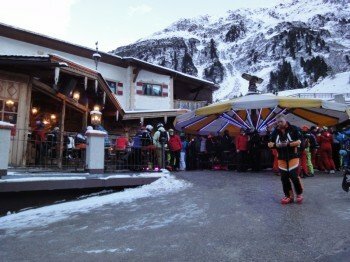 The mountain restaurants and lodges in the Stubaier Gletscher ski area ensure that nobody goes hungry on the hill. First choice for families is probably the self-service Gamsgarten restaurant close to the children’s area, and this is also the largest establishment on the mountain. There is space for some 545 guests and all the classics are served – from sausage & chips to goulash soup. The Eisgrat restaurant is specialised in pasta and even makes all its noodles in house. The open kitchen allows guests an insight into how the Alpine pasta is made before it finds its way onto the plate. The restaurant’s generously-sized sun deck is also a treat for anyone looking to take in the eye-catching panorama. The highest restaurant in the ski area is Jochdohle, just 5 minutes from the Schaufeljoch mountain station. This futuristic-looking eatery has made a name for itself with its XXL schnitzel. The Dresdner Hütte, close to the middle station of the Stubaier Gletscherbahn lift, also serves good food, while the Berghütte Bödele offers tasty snacks served in quaint surroundings. If you feel like grabbing a coffee or a small sweet treat, look no further than the Cafe Bar Zum Steinbock – it is located on the Eisgrat and serves coffee and ice cream specialities. The most legendary run in the ski area is undoubtedly the black-marked Daunhill with a 60% gradient. Stubaier Gletscher also has a great deal to offer visitors who left their skis or snowboard at home. There is an ice cave at around 3,000 metres that offers fascinating insights into the world within the glacier. A specially-marked path leads from the Eisgrat mountain station to the cave entrance. What is glacial milk? What are the individual layers in the ice called? 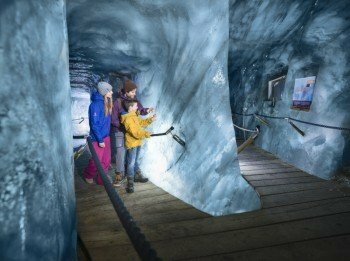 How can the glacier be protected? Visitors can find answers to these questions and many more here. The tour is around 150 meters in length and is just 30 meters from the edge of the marked ski runs. Another highlight away from the slopes is the “Top of Tyrol” viewing platform which extends nine metres out from the rock at 3,210 metres. The viewpoint offers up sumptuous views of no less than 109 mountains of over 3,000 meters, extending all the way to the Dolomites. The special Viscope telescope enables a close-up view of the peaks. Visitors to the area will find an oasis of peace and contemplation on the Schaufeljoch, as the hill has been home to a chapel since 2012 which nestles perfectly between the ice and the stone. Just 9 m2 in size, it offers incredible views of the mountains to both sides – a little piece of heaven in the ski area. From the Gamsgarten mountain station, you can also take the maintained walking path up to the Top of Tyrol panoramic platform. This requires good stamina, as it means scaling around 600 vertical meters on foot. It is the perfect hike for enjoying the clear mountain air and astonishing views of the surrounding peaks. Plan around one and a half hours for the ascent. Happiness and a good mood come as standard in the Stubaier Gletscher ski area, so expect lively après-ski here. 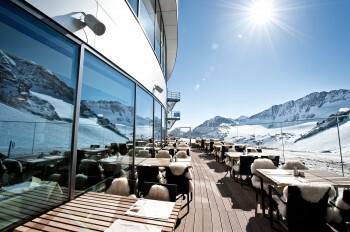 On the mountain, head over to the Schneekristallpavillion on Gamsgarten for great cocktails and glasses of champagne. Live acts also appear here regularly. You should also keep an eye open for the “Eiswürfel” – this mobile bar is always set up in a different location in the ski area and is the perfect place for a quick refreshment. Our tip: The Mutterbergalm! This is the place to come for après-ski and guaranteed party. Stubaier Gletscher is a great destination for foodies too, with two gourmet restaurants in the direct vicinity. The award-winning restaurant Schaufelspitz has received 14 points from Gault Millau no less than 3 times and has also been awarded two “Hauben”. The restaurant is housed in the Eisgrat mountain station and offers space for around 55 guests, with another 50 seats on the sun deck. The Zirbenstube room and cosy open fire ensure a welcoming atmosphere that is well worth experiencing. If you only want to come for the food and not for the skiing, you can get a refund on your winter hiking ticket. The Restaurant zur Goldenen Gams on Gamsgarten is also a culinary treat. Regional delicacies are offered here alongside international favourites, as kaiserschmarrn and käsespätzle meet pizza and pasta. Stubaier Gletscher is around 45 minutes from Innsbruck. Follow the A 93, keep left at the fork and continue on the A 13. Take exit 10 Schönberg and follow the signs for Stubaier Gletscher. Take the third exit at the roundabout. If you are travelling by train, head for Innsbruck HBF. From there, you can catch regular scheduled buses to Stubaier Gletscher. The nearest airport is also in Innsbruck, around 45 km away. Here you have the choice of taking a hotel shuttle service or a taxi to the ski area.